After 10 beta releases and 2 release candidates, Zap Calendar 3.0 has reached production status. Zap Calendar 3.0 supports Joomla versions 1.5, 1.6, 1.7 and the just released 2.5 version. It is available now to all current subscribers. Zap Calendar 3.0 supports Joomla's ACL feature with Joomla versions 1.6 and above. It also comes with 3 new addons. The password plugin (standard and pro versions) provides a simple mechanism for requiring a password when adding or editing events to a calendar in the front-end. This is a simple alternative to creating ACL rules in Joomla 1.6 and above or Joomla 1.5 sites where ACL support is not available. The month header plugin (standard and pro versions) provides one click access to any month in the current year. All month names are displayed in a horizontal line above the calendar for easy navigation between months. This plugin supports calendars starting on months other than January ( a school calendar, for example). If only one time is specified, then a one hour meeting is assumed. If no time is specified, then an all day meeting is assumed. Events can also be created using the quick add feature found in Zap Calendar's back-end panel display. Updated Photo Header plugin - You can now click on the photo to browse from month to month, similar to clicking on photos in Facebook to display the previous or next photo. Zap Calendar 3.0 is now available for download to Zap Calendar subscribers at http://www.zcontent.net/zapstore . Has your subscription expired? No problem, just follow the same link, login to your account and renew your subscription. After 10 beta releases, Zap Calendar 3.0 has finally reached the "Release Candidate" status. This is the final phase before the product production status. This release fixes numerous issues, include PHP 5.3 compatibility issues with several plugins. 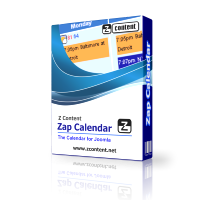 Zap Calendar 3.0 supports Joomla versions 1.5, 1.6, 1.7 and the just released 2.5 version. It is available now to all current subscribers. This release includes the new password plugin, available to standard and pro subscriptions. This plugin provides a simple mechanism for requiring a password when adding or editing events on a calendar in the front-end. This is a simpler alternative to creating ACL rules in Joomla 1.6+ or for Joomla 1.5 sites where ACL support is not available. If only one time is specified, then a one hour meeting is assumed. If no time is specified, then an all day meeting is assumed. Create an event manager who can create and manage events but can not create or manage articles. Create a special group of users who can create and/or edit events from the front-end. Allow additional back-end users to maintain categories, locations and views. Provide multiple access levels for front-end groups ( i.e. add and delete, add-only, add, edit and delete, etc). Beta 9 is now available for download to Zap Calendar subscribers at http://www.zcontent.net/zapstore . Zap Calendar users can renew or upgrade their subscription of Zap Calendar at the same link. We are pleased to announce the availability of the third beta release of version 3.0 of Zap Calendar. This release provides support for three versions of Joomla: versions 1.5, 1.6 and 1.7. It is available to all current Zap Calendar subscribers, which can be downloaded from the My ZApps page at the Zap Store on the Z Content website. This is a beta release and has not been extensively tested. You should test the product in your environment to see if the beta version is suitable in your production site. Any issues found with this beta release should be posted to the Zap Calendar forum at the Z Content website. What 3 Words Best Describe the Latest Version of Zap Calendar? OK, that is a variation of a bad joke, but it does highlight the major feature of version 2.2 of Zap Calendar, which is expected to be released in April. The new location feature in 2.2 will allow you to group events by location and display a calendar of only those events at that location. By using Zap Calendar's powerful calendar view feature, you can choose what type of calendar to display for a location: monthly, weekly, upcoming and more. iCal and CSV imports make it easy to associate events to locations automatically by matching events with the same location text. What else is new in version 2.2? CSV import now recognizes date, time, duration, title, location and description fields. Meetings and all day event imports are now supported. You can now edit repeating events, either singularly or as a group, from the front end. You can also either delete an entire repeating event series or a single event within the repeating series from the front end. This is similar to repeating event editing that has been available in the back end. Two additional language translations are included. In addition to Spanish and Brazilian Portuguese, French and Swedish languages are now included. Zap Category Controller (both module and plugin): You now have the option to display groups of categories in tree fashion (the tree is limited to one level of groups). RSVP Plugin: The administrator or event owner can now edit a user's RSVP. Administrator only fields allow the event owner or administrator to add additional data to the RSVP. MyRSVP Module - The administrator can create a report of a user's RSVP activity in the back end. The front end display can now be oriented horizontally or vertically. For a complete list of features, read the change log posted in the forums. Version 6.03 will correct this issue, which only affects the Z Weather component. All other files are unaffected. Did you know Zap Calendar works with the iPad and iPhone (iTouch too)? In fact, this Zap Calendar feature has been available since the iPad's introduction. With Zap Calendar's full support of the iCal standard, you can synchronize events on a Zap Calendar enabled web site to your iPad or iPhone easily. 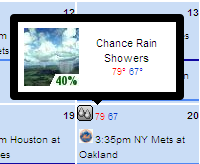 From the Safari browser, navigate to your Zap Calendar page. Click the subscribe option in the upper right corner (if you don't see it, you may need to enable the option in the calendar view settings). 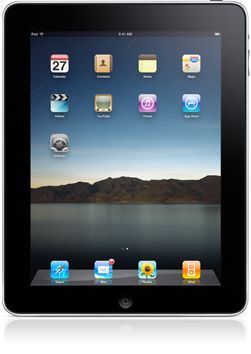 From the popup window, just select the Apple link and your iPad or iPhone will be synchronized with the calendar. Now, when an event is added, modified, or deleted in the calendar, your iPad or iPhone calendar will be automatically updated. How cool is that? If you are on your iPad or iPhone now, you can try it now from the American History Calendar web site by clicking here. Vote at extensions.joomla.org site - Visit the Zap Calendar listing by clicking here and vote for Zap Calendar. You can even write a review. We believe honest reviews from customers are very important and much more valuable to others when considering Zap Calendar than anything we can say about the product. Like us on Facebook - Join the Z Content page on Facebook by clicking here, or go to the Z Content site and click the "Like" option in the upper left corner. Follow us on Twitter - Follow us on Twitter by clicking here.